← Accor LeClub Promotion: Earn up to 7,500 bonus reward points with three stays! It has been a tough time for European airlines – after the bankruptcies of Air Berlin and Alitalia and the collapse of Monarch and Primera, another low-cost carrier has abruptly stopped operations, stranding thousands of passengers. 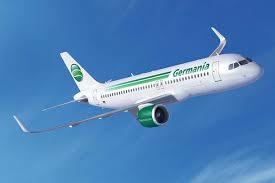 German leisure airline Germania declared bankruptcy on Monday, halting all operations. Passengers who are booked on a flight as part of a tour package need to contact their tour operator for rebooking, travelers who booked directly with Germania will have to find their own flights, at their own cost. Germania was a low-cost carrier, operating flights to more than 40 destinations in Europe, North Africa and the Middle East. They transported about 4 million passengers per year with a fleet of 36 planes. They had a strong position at several smaller airports, like Erfurt in Eastern Germany where they had a market share of 70%. The German subsidiary Germania, as well as related service businesses have shut down, while Swiss Germania and Bulgarian subsidiary Eagle are unaffected. Germania had started an expansion with a large order of new Airbus planes and a shift from charter flights to scheduled flights. That expansion appears to have been too much, too fast. Rising fuel prices and increased maintenance needs resulted in shortage of cash and Germania wasn’t able to pay its employees in January. Negotiations to obtain financing or find investors failed, leaving Germania no choice but to declare bankruptcy. What does that mean for Germania passengers? Any passengers who purchased their flight as part of a vacation package tour is protected – according to European law, the tour operator is responsible in case of insolvency and has to arrange for alternative transportation. Customers should reach out to the tour operators to arrange alternative flights, dates and times of travel may shift. Independent travelers who booked flights directly with Germania or through an agent will have to arrange their own replacement flights at their own cost. While they can file for compensation with the airline, experience from similar cases shows that the compensation will be minimal if anything, likely less than 10%. If you have paid with a credit card, you can file with the credit card company and may be able to dispute the charge for a full refund. Several airlines, including Lufthansa’s budget arm Eurowings, Lufthansa, Swiss and Austrian, as well as Condor and TuiFly offers special conditions. Travelers stuck abroad can purchase Eurowings tickets with a 50% discount find out the details here! Budget airline RyanAir is offering discounted tickets for Germania customers whose future vacation is at risk. Plenty of airline experts expected more consolidation among European airlines. Compared to the US, there are a lot more airlines serving the market and prices are very low. Other airlines have been struggling, too, with Wow Air barely escaping insolvency and Norwegian Air continuously in the news for financial problems. Even Ryan Air reported poor financial results recently. I don’t think we have seen the last bankruptcy among European airlines and there is more turbulence ahead.